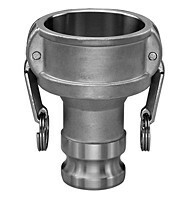 # RDA-A3020 - Reducing Couplers x Adapters - Aluminum - 3 in. x 2 in. Coupler x Adapter 3 in. x 2 in.